The ground around your home is wet. 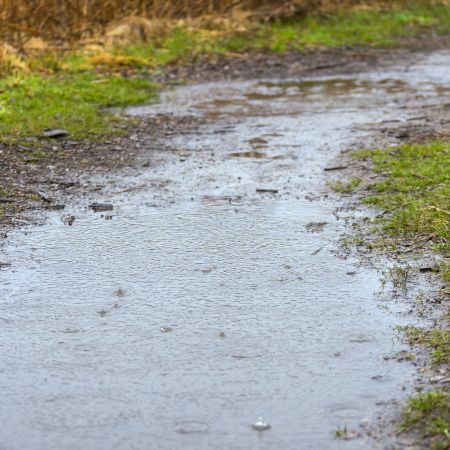 It hasn’t rained in days, but your yard is still saturated with water. Significant ground saturation makes it hard to enjoy your outdoor spaces. Whether water is pooling next to your foundation or just creating soggy conditions around your property, it’s a nuisance. In many cases, it creates a breeding ground for mosquitos. Poor grading causes most ground saturation around homes in metro Atlanta. Our clay soil also tends to hold water, especially in flat areas. Inadequate grading in conjunction with the local soil composition is a recipe for nuisance ground saturation. 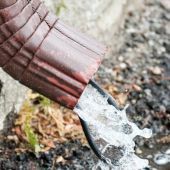 While a lack of French drains, catch basins, or other stormwater collection equipment certainly contributes to the problem, grading is often the culprit. To truly address the problem, you usually have to restructure the surrounding landscape – a big undertaking. For these reasons, it’s difficult to completely eliminate ground saturation. While certain drainage products will improve the problem, significant progress often requires significant measures. Get started! We are here to help. When the grade of your lot contributes to the problem, we may apply grading techniques that reduce or eliminate the “holding” of stormwater in problem areas. We can collect and move water away before it contributes to unwanted saturation. 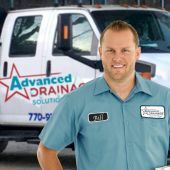 In most cases, downspout drain lines, properly located and installed catch basins, or French drains will improve saturation issues. Dry creek beds, walkways, sod, and even French drains can help reduce ground saturation. We apply landscape and hardscape finishes when it makes sense for your situation. We come to your home to discuss the problem. Show us where the ground saturation occurs and share your thoughts on when, why, and how the ground stays wet. 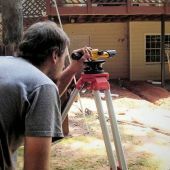 We examine your home, yard, gutters, downspouts, and drainage features to identify the source(s) of ground saturation. Using insights from our analysis, we provide a plan to improve or remedy the problem. Repairs may include grading, drainage installations, or corrections to existing drainage features. On a scheduled date and time, we take action. 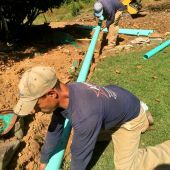 Our team applies a drainage solution designed to reduce ground saturation and make your outdoor space more inviting.